Our mission is to positively impact communities around the world by assisting travelers who want to take meaningful contributions to the destinations they visit. There is need everywhere in the world; however, it is sometimes difficult to identify specific needs in places far from home. We believe many people fortunate enough to travel wish they could make meaningful contributions to help meet the needs of the places they visit. 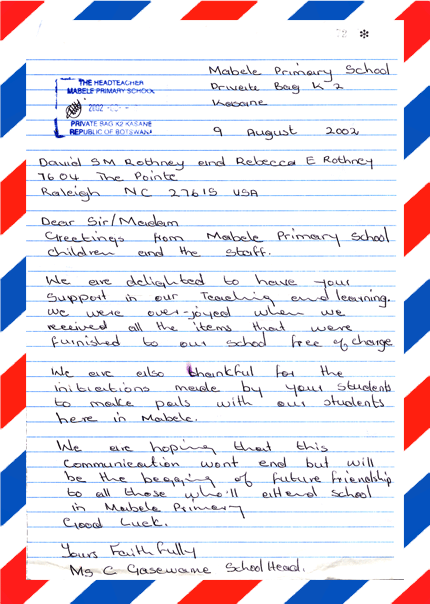 Such contributions are one way of expressing appreciation for the experiences and hospitality they enjoyed. Our goal is to assist travelers who want to say thank you in this manner or who simply want to expand their generosity beyond their own communities. The supply lists for destinations on our website are provided directly by the local community-based projects that receive and use the supplies, enabling travelers to make informed decisions and to take items that meet the needs of those who will be using them. The members of our board of directors are experienced travelers and active contributors to their communities. Our board members include entrepreneurs, professionals, and employees of local businesses. Collectively, they have traveled to all seven continents. They also continue to be involved with many other non-profits and are committed to enhancing the global community in which they live.